VATICAN CITY (CNS) — Christ’s call for his disciples to be one requires that even as they try to resolve their differences on doctrinal and moral questions, they must get used to working and praying together, Pope Francis said. “Increasingly we are learning to ask ourselves: This initiative, can we share it with our brothers and sisters in Christ?” the pope said Feb. 6 in a speech to leaders of the Council of the Evangelical Church in Germany, a body representing Lutherans, Reformed and United communities. 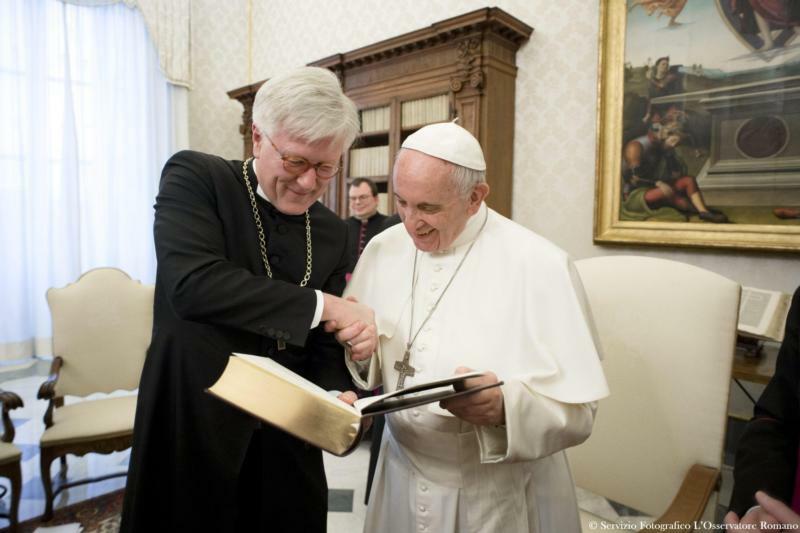 He told reporters later that the group had discussed the question of eucharistic hospitality — sharing Communion in certain circumstances — with Cardinal Kurt Koch, president of the Pontifical Council for Promoting Christian Unity. In general, the position of the Catholic Church has been that regular eucharistic sharing is not possible until full unity has been restored. The Rev. Annette Kurschus, deputy head of the evangelical council, said it is important to note that the push for greater opportunities for sharing Communion is not coming from church leadership, but from the grass roots, from active Catholic-Protestant couples who suffer when they cannot share such an important part of their lives. “If we perceive their suffering, the division, then maybe it will be possible to overcome it,” she told reporters. Pope Francis told the group that when the world is experiencing “serious rifts and new forms of exclusion and marginalization,” Christians have an even greater responsibility to respond to Jesus’ call to unity and to being witnesses of reconciliation. “We know where we have to stand,” the cardinal said.